It’s not often I buy a single-issue comic book (or, as I affectionately refer to them – floppies), but I could not resist this issue due to the title alone. 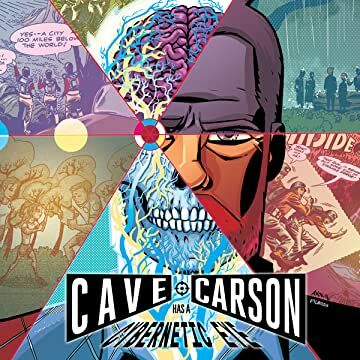 Cave Carson would not have garnered my curiosity, but Cave Carson Has a Cybernetic Eye? Yes, that’s the kind of title that demands my attention. I remember Cave Carson from my old Who’s Who comic books. I don’t think I ever actually had a comic book with Cave in it, but reading about him in Who’s Who made me consider him a strange character. Not quite a hero, but not quite a regular guy, either. I categorized him in there with the Challengers Of the Unknown or the Sun Devils. Gerard Way and Jon Rivera have taken what I would consider an obscure character and made him riveting. Part of the fun of Cave Carson is that most of us don’t remember a single thing about him. I’m 39, and I recall from my childhood him having underground adventures with his team, but that’s about it. Cave Carson is now a widower. His wife, and also teammate, died of an illness, and his daughter has grown into an independent college student. Strangest of all, he has a cybernetic eye, something new to the character. Why does he have a cybernetic eye? That has yet to be revealed, but the eye is causing him all kinds of problems because it’s acting almost of its own accord. Carson is depressed, purposeless, and suffering psychedelic visions that may or not be real. Way and Rivera set up ample plot opportunities, develop interesting, engaging characters, and provide several satisfying guest appearances. I won’t spoil it for you, but the very last page offered the return of a much beloved, equally obscure character from my childhood. But do you know what really sets this book apart? Micheal Avon Oeming. Way and Rivera’s script might have been rather pedestrian in the hands of a lesser artist, but Oeming has a unique, weird style to his art that suits a book such as this perfectly. His art is slightly cartoonish due to odd perspectives and angled characters, but it sets the tone so perfectly while catching the eye’s attention – it’s magnificent to behold. Somehow Oeming makes characters simply taking to each other dynamic. That’s the sign of a great sequential artist. Best of all, there’s some really fun stuff in the back of the book. Again, I won’t spoil it for you, but they did something totally fresh that took me back to my younger days of DC readership. Though it’s been out for a few weeks, I absolutely recommend Cave Carson Has a Cybernetic Eye #1. It’s one of the most original comic books I’ve read in some time. In fact, this title has made me enthusiastic for the other Young Animal imprint’s titles. I’m going to see if I can still find some of those first issues. This entry was posted in Book Reviews and tagged arts, books, cave carson has a cybernetic eye, comic book reviewer, comic book reviews, comic books, DC Comics, entertainment, gerard way, jon rivera, michael avon oeming, reviewer, reviews, young animal comics.